In the Army we use a huge range of equipment, from rocket launchers to binoculars. As a Technical Support Specialist, you look after all of this kit, making sure your unit has whatever they need, whenever they need it. You’ll receive a lot of responsibility very early on, getting the training required to manage weapons, ammunition, vehicles and tools. You will be responsible for millions of pounds worth of equipment and gain first class managerial training and experience. You will travel the world supporting fighting units and have fantastic opportunities for sport, making friends for life. 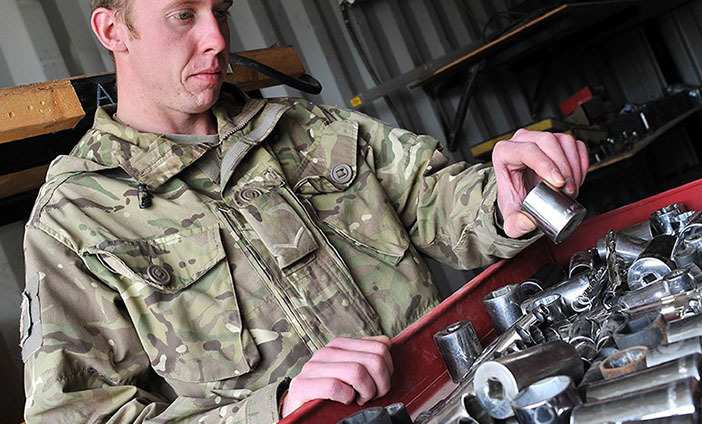 You'll start with your initial military training which will teach you how to be a soldier - this will cover everything from fieldcraft to how to handle a rifle. If you join as a Junior Soldier (under 17 years 5 months), you’ll do a 23-week basic military training course at Harrogate. If you join as a Regular Soldier (over 17 years 1 month), you’ll do the regular 14-week adult basic training. Then it’s off to the Defence School of Electronic and Mechanical Engineering at MoD Lyneham. Over the next 12 weeks, you learn how to run a unit’s entire technical store and deal with demands. You will also be taught to drive and gain your car and HGV licences. Learn about rank progression here. Earn £15,230 during training. When your Initial training is finished, and you join your unit as a Private your pay will rise to £18,859. Once your online application has been approved, you'll meet with a local recruiter. This is your chance to tell us about the role that you're interested in. When you go to the Assessment Centre,you'll take tests - the results will show whether you'd be suitable for this role, or should consider a different role.